What Sort of Predictions Do the Players Have for the WSOP Colossus? PokerNews dives into the hallways of the Rio to find out what sort of predictions various poker players have for the massive Colossus event at the 2015 WSOP. May 29 is here, and with it comes one of the most historic days in poker. Event #5: $565 Colossus No-Limit Hold'em is a tournament the likes of which the game has never seen. Featuring a buy-in of $565 and a guaranteed prize pool of $5 million, this event has had the poker world abuzz for months since its announcement in late 2014. Anyone with a dream, a few Ben Franks, and even a small amount of poker know-how has a shot to become a millionaire. Thousands have streamed into the Rio All-Suite Hotel & Casino from all over the world, packing the hallways to the gills as they inch forward in massive lines to register the event. While a sea of mostly anonymous faces will comprise the field, plenty of pros and other well-known players will dot ranks. We asked that subset of players to offer predictions about the Colossus, ranging from simple guesses about the field size to how many bathrooms will be needed. Here's what they had to say. Eric Crain foresees a huge field, and he said running such a monstrous tournament won't be without its hiccups. "I'm going to guess 22,000 players," he said. "I'm going to guess it's going to be the biggest cluster**** in the history of the World Series, but at the same time the energy in there is spectacular." Two players agreed with that assessment. "It's going to be a s*** show," Jimmy Fricke said. He said he hadn't heard any updates in awhile, but predicted a field of 18,000. Aaron Steury said the exact same thing. He got more granular with his prediction, offering up 23,256. Blair Hinkle guessed 17,250, and he got more specific with his concerns. "Bathroom breaks should be at least 45 minutes," he said with a laugh. "They should line portapotties all up and down the rooms." 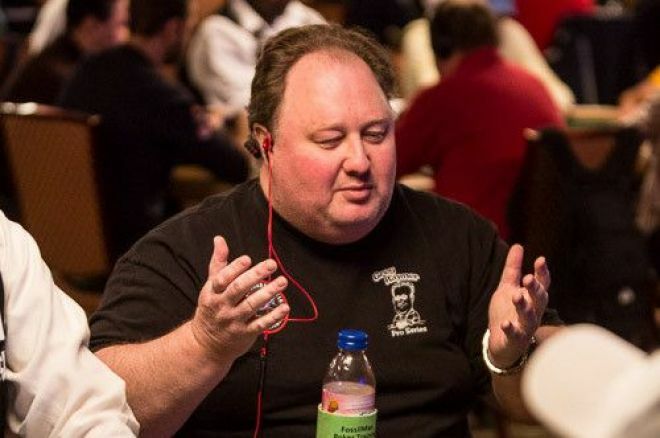 Former WSOP Main Event champ Greg Raymer declined to offer an exact number. "I'm horrible at setting lines," he said. "It'll be too many. I would not want to be coming in late to the will-call line." Of those who were bold enough to put forth a guess, a number around 20,000 seemed to be the predominant feeling. "They'll probably get like 20,000," World Poker Tour Player of the Year Anthony Zinno said. "Put me down for 21,000." "We're looking at 19,264," Dan Heimiller said. "I think it's going to beat 20,000," Brandon Cantu said. "I told a bunch of my buddies from back home, if you're ever going to play an event, this is the time." "I think it's going to be about 21,000," Maurice Hawkins said. Despite the unheard-of field size that's sure to be chock full of amateurs, Hawkins guaranteed a professional would emerge as the winner. "It's going to be a professional, 100 percent," he said. "Whoever gets lucky enough to stack an amateur who spazzes off a large stack, it's going to be a big, big advantage." Will Givens set the bar a bit lower at 13,000 and compared the Colossus to online poker's most famous tournament. "It will be like the Sunday Million live, playing against a bunch of satellite qualifiers," the Colorado native said. That's a very good thing, according to Heimiller. "I wish they played nothing but Colossus," he said. "I want to play against people that want to gamble, and you don't get that in a $10,000 tournament." Hawkins said to pump the brakes on any more than one $565 tournament per year, but added he expects it will be a huge success. "I think it's probably the best thing to happen since the poker boom," he said.